Earlier this year, we reported that more than 100 million apps had been downloaded from Samsung Apps. 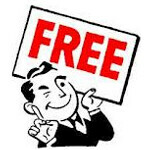 Now, Samsung is giving away up to 16 free apps from the web site to users of certain Samsung Galaxy devices. The games include such titles as Air Penguin, Air Attack HD, Riptide GP, Paladog, Sprinkle. Samsung says that it is offering the free games as a way to spark awareness about Samsung Apps as an exclusive destination for owners of Samsung smartphones and tablets. 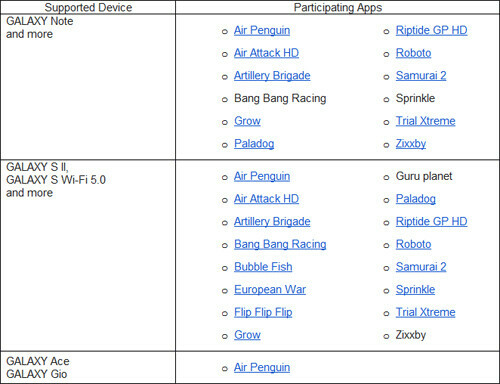 Those who own the Samsung Galaxy S Wi-Fi 5.0 and the Samsung Galaxy S II will be able to install 16 free apps. Those with the Samsung GALAXY Note can choose from 12 free apps while Air Penguin is the lone free app that can be installed by those who have the Samsung Galaxy Ace and Samsung GALAXY Gio. This is the time of the year for giving, so we are happy to hear that there is a free lunch for those who own the Galaxy models covered by the promotion, even if Samsung's goal is to sell you more apps down the road. To check out which apps are available for which device, check out the chart below. Samsung... don't forget that U HAVE BADA USERS... UR APPSTORE IN MY CORBY II IS ABSOLUTELY WORTHLESS. um does the galaxy nexus apply for this?? best of both worlds? My skyrocket is galaxy s2 right? i have a samsung galaxy s2 for at&t. 1. does that qualify? 2. how do i even get the samsung app store? no..I haven't figured it out yet either...when I try to access these apps from the browser on my at&t S2 it says that my country isn't supported.. The list of countries in the Americas doesn't have the US..so maybe we can't really use it?? Or only the international version users can avail the offer? Can someone verify this? I have been downloading apps from Samsung app store for A While Now.. Although most. Of. Them aren't really good but a few are really awesome. Like I got asphalt 6 HD for free instead of the 350rs price on the android market. Plus it had better graphics. I would recommend samsung apps to all as they do provide good apps for superb value.